v o z i a n o v brand is designed by fedor vozianov. 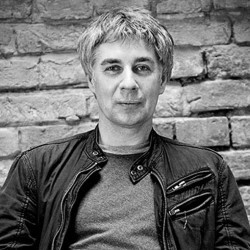 fedor was born in kyiv. he obtained university degree in linguistics. fashion design has been his passion since he was a young boy. Some of his creations go beyond the conventional confines of the fashion design and evolve into the 'thing' serving a dual purpose: an article of clothing or accessory easily transforms into an object of art or visual design.